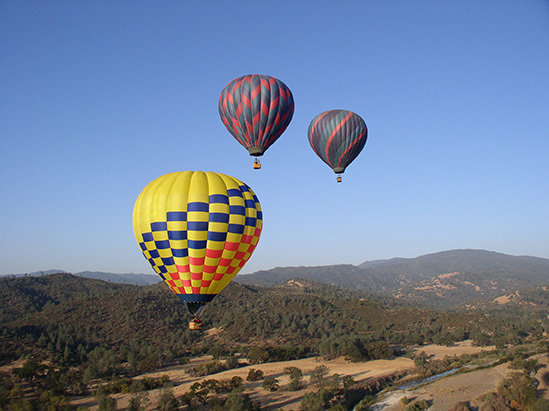 Have the adventure of a lifetime with Up & Away Hot Air Ballooning. When you float over Wine Country in a hot air balloon! Up & Away Ballooning will provide you with everything you need to complete your journey, whether it is for a birthday, wedding proposal or just the highlight of your trip. This is an adventure you will never forget! You’ll meet early at the The Shed in Healdsburg. Then your journey will begin at the best available launch site to make it the most picturesque and the safest flight. After helping to inflate the balloon (that’s part of the fun! ), and a safety orientation, your one hour flight can range from 3 to 10 miles, depending on the wind current. Depending on the altitude, you may see the Pacific Ocean, look into the Napa Valley or on a clear day, the buildings in San Francisco 60 miles away! At lower altitudes you will fly just above the grapevines and see rabbits, deer and other wildlife. You may even dip into a lake or pond for a “Splash and Dash”. When the pilot is not adding heat to the balloon, you will hear peace and quiet like no other you have experienced. You will also feel the unique experience of looking out all four “windows”. No other form of flight offers such oneness with nature. The wonderful flight you just had is only half of your special morning. After landing, Up & Away will take you back to The Shed for a farm-to-table gourmet brunch. You’ll toast the spectacular day with a mimosa or glass of sparkling wine while savoring the best that Healdsburg has to offer!